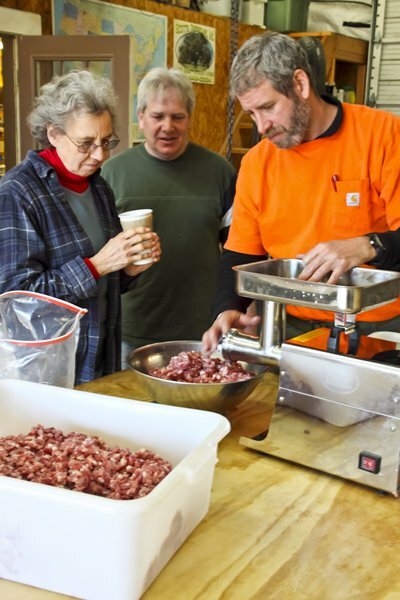 At Bluefield Acres, we grind and blend our own sausage using fresh meat from naturally raised American Guinea Hogs. 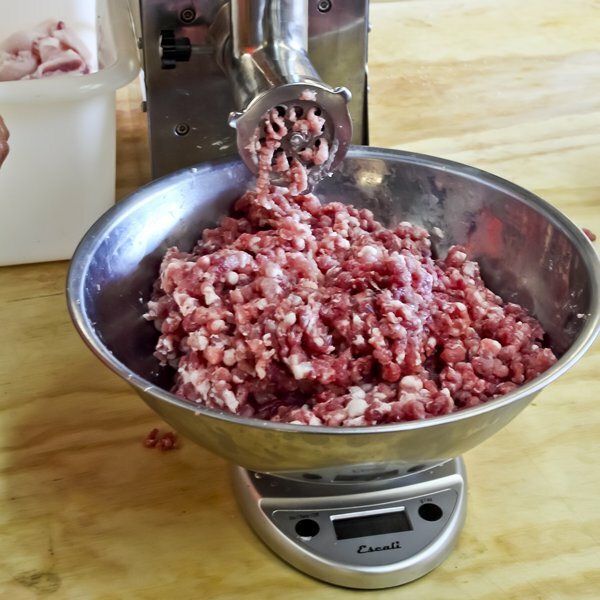 You can use the following recipe to blend your own sausage, but it may need adjustment depending on the pork you use. Our Guinea Hogs graze for much of their food, which may account for a higher salt content in the meat. We're not sure why the meat is saltier, but we use less salt in our GH sausage than we would if using commercial pork (about 2 grams less). If you are raising your own hogs on pasture or forage, please keep this in mind, as you may find it necessary to play with the recipe to make it work with the terroir of your farm (soil, climate, topography) and the eating habits of your animals. If starting from scratch, cut separated meat and fat from your animal into cubes, then blend at 80% meat to 20% fat. Cool in refrigerator before grinding, then course grind this mixture once without spices and refrigerate again until cool. We use an LEM grinder. Next blend in the spices at the following measurements and grind the blend twice on course to medium (depending on your preference). We prefer our sausage course ground and mix it to have a low fat content. Remember to cool the sausage in the refrigerator between grinds to keep the meat from getting too hot, and always wash or freeze grinder attachments between grinds to prevent contamination.